Cute new haircut or not (pic obviously pre-haircut), I think it's time we say "that's all folks!" to our good friend, Scott MacIntyre. In fact, I'm surprised, well, no, nevermind. I'm not surprised Scott made it this far. He is endearing . . with his awkward audience acknowledgments, Seacrest high-fives, and little one-liners he delivers to the judges that champion him as a hero rather than a rude a-hole. It's just that I would like to see him gracefully make the exit tonight before the show makes any kind of mockery of him. I feel we might be pushing that envelope. 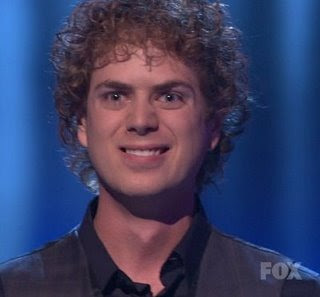 After last night, it is clear we have reached the point where the judges (with the exception of Simon) are just giving him gentle critiques all the while thinking in the back of their minds, "there's no way in hell this kid is going to beat Adam." So let's just part ways now, Scott, while everything is just mellow and cool, ya dig? In the meantime, I predict my bottom three to be: Scott, Anoop and for once, Little. Who do you all want to see go tonight? Lil over Scott? Scott over Lil? And which three do you think should be occupying the three silver chairs of hell while the rest sit comfortably in couch heaven? Or who just doesn't care and would only like for me to take this Scott picture down? Okay. I think it will be Scott. I wish it was Matt, but dammit he covered the forehead boil with the fedora and the judges gave him kudos. Three lowest vote getters tonight. To echo the judges.....what happened to Lil?? Man, she grew long hair and sapped her individualism. Simon: We don't know who you are Allison. Huh? I see her as much as he does, maybe less, and I know she's an incredibly fun loving, sixteen year old with spirit and energy, has an unbelievable voice and stage presence. I know she listens to the judges critiques, and carries through with them, and isn't annoyingly sassy when standing next to Ryan. What more does he need to know? I SO want to see Allison and Adam side by side on the final night. Adam. Oh Adam. You definitely fit my idea of an idol. Kudos to everything you just said! I know! Why can't they just embrace all that is to love with Allison? I don't know why Simon can't. I tell you . . it's Sabotage! And, well, I probably don't have to say it, but I would rather see the boil than the fedora. Lil + Hair Extensions = Identity Theft. Matt + Fedora = Identity Crisis. If he would just be the artist he is supposed to be, I would love to buy one of his CD's. Sure, he can make a third-rate Justin Timberlake album (which he is hell-bent on doing), but no one's going to buy it. Whew!!! Glad to hear that, is my fav blog an' I would miss reading it.